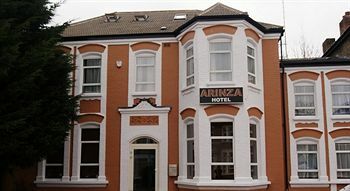 Property Location With a stay at Arinza Hotel in Ilford (Redbridge), you'll be 11 minutes by car from South Park. This hotel is 6.1 mi (9.8 km) from London Stadium and 8.9 mi (14.4 km) from O2 Arena. Rooms Make yourself at home in one of the 22 air-conditioned rooms featuring LCD televisions. Complimentary wireless Internet access is available to keep you connected. Private bathrooms with showers feature complimentary toiletries and hair dryers. Conveniences include phones and desks, and housekeeping is provided daily. Amenities Take in the views from a garden and make use of amenities such as complimentary wireless Internet access and a television in a common area. Dining Continental breakfasts are available daily from 6:30 AM to 9:30 AM for a fee. Business, Other Amenities Free self parking is available onsite.